John Taylor Arms. Shadows of Venice. Etching. Shadows of Venice. 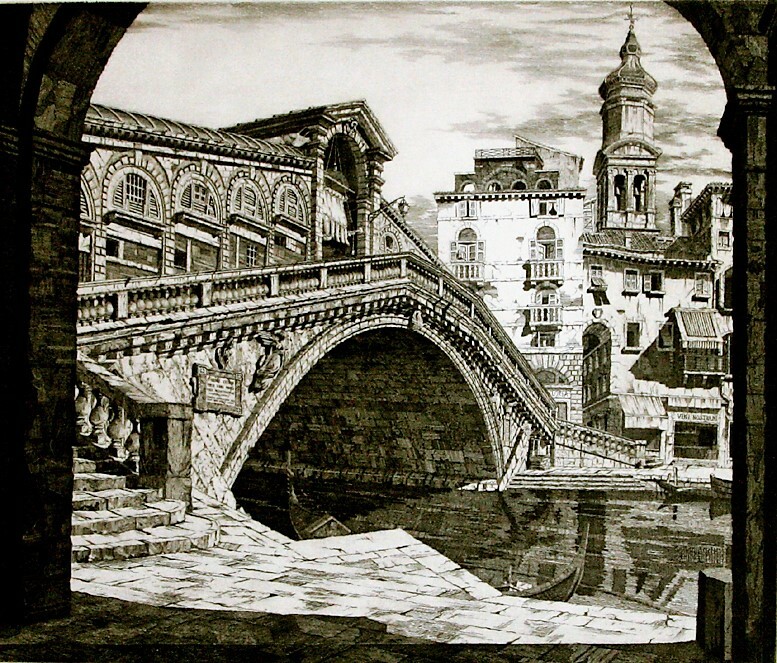 (Il Ponte di Rialto, Venezia.) 1930. Etching and aquatint. Fletcher 229.ii. 10 1/8 x 12 (sheet 11 5/8 x 16 1/2). Italian Series, plate #16. Edition 140 (+ 14 trial proofs). Illustrated: Dorothy Noyes Arms, Hill Towns and Cities of Northern Italy, p. 208; The Print Collector's Quarterly 21 (1934): 136; Fine Prints of the Year, 1931; Eric Denker, Reflections & Undercurrents: Ernest Roth and Printmaking in Venice, 1900-1940.A fine impression on cream laid paper. Signed, dated and annotated 'Edition 100' in pencil. Shadows of Venice. was the artist's diploma print for his acceptance as a member of The Royal Society of Painter-Etchers in 1934. $2,500. The Rialto Bridge (Ponte di Rialto) is one of the three bridges crossing the Canale Grande. It connects the districts of San Polo and San Marco. Built in 1591, it consists of two rows of shops and three footways. The shops only face the middle way, and sell fruits, vegetables and all kinds of tourist stuff. The Rialto Bridge is located about 500 meters north of Saint Mark's Square.